Earlier this year, Phase Two of the Marvel Cinematic Universe came to a close with the superhero blockbusters Avengers: Age of Ultron and Ant-Man. Starting tomorrow, fans can relive all of the Phase Two movies in the 13-disc Marvel Cinematic Universe: Phase Two Collection, debuting on Blu-ray tomorrow, December 8. This collection will also include sneak peeks of upcoming Phase Three movies, with USA Today debuting a portion of the box set's Doctor Strange preview. Since production just got under way a few weeks ago on Doctor Strange, this video doesn't include any actual footage from the movie itself, but we do get a glimpse at concept art of Benedict Cumberbatch as the Sorcerer Surpreme. Producer Kevin Feige reveals how "huge" it was for the studio to have landed Benedict Cumberbatch as Doctor Strange. 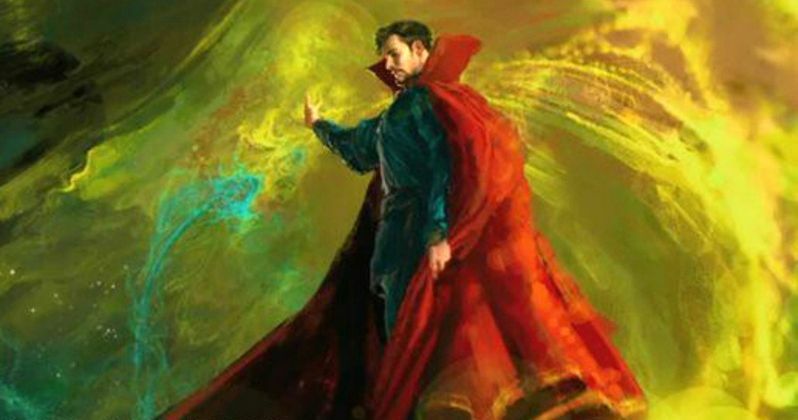 We also hear from director Scott Derrickson, who reveals that the Sorcerer Supreme has an "incredibly complicated emotional structure," while executive producer Stephen Broussard says they're trying to keep this "magical story" as grounded as possible, that still allows for interesting visual ideas to come forth. Doctor Strange follows the story of neurosurgeon Doctor Stephen Strange who, after a horrific car accident, discovers the hidden world of magic and alternate dimensions. Doctor Strange is the latest film in Phase 3 of the Marvel Cinematic Universe. Phase 3's goal over the course of four years and nine films is to introduce audiences to new heroes and continue the adventures of fan favorites. The supporting cast is rounded out by Chiwetel Ejiofor, Rachel McAdams, Michael Stuhlbarg, Mads Mikkelsen, Tilda Swinton, Amy Landecker and Scott Adkins. Scott Derrickson (Deliver Us from Evil) is directing from a script by Jon Spaihts (Passengers), with the studio already setting a November 4, 2016 release date. The superhero adventure will be going up against Warner Bros.' Bastards and 20th Century Fox's Trolls. This Doctor Strange sneak peek is just a small part of the bonus features included on the Marvel Cinematic Universe: Phase Two Collection. The special features will also include sneak peeks for Phase 3 films Captain America: Civil War and Guardians of the Galaxy Vol. 2. While we wait for more on Doctor Strange, take a look at this new preview and concept art below.